Do you often wish you had done something different? Wish you would have taken a different route at a certain age? Wished you made a different decision to get an alternate result? Of course you have. We all have. Regret is a daily occurrence. We might get a speeding ticket and wish we had driven slower, or chose to wake up early to get something done. Maybe it’s something bigger where we wished we had gone to school for engineering instead of journalism, or married our high school sweetheart instead of our college love. Whatever it might be, it’s a regret. In this blog we will go through the basic steps to understanding what a regret is, what it does to us, and how to deal with it. Let’s just make sure we understand what regret it first. It is not a mistake, it is not failure, and it is not anything we have done wrong. A regret is looking into a past decision we made and fantasizing what might have happened if we had choose to do it differently. A common example is we look at a lotto ticket and see 3 out of the 5 numbers we got right. We then fantasize for the next week what our life would be like if we had put the correct numbers down instead. We sit and dream what we would be doing with those millions of dollars we had won, like dancing on a yacht in a Ninja Turtle suit sipping champagne with our friends on our way to Italy to eat some good pizza. We take life out of the perspective it is in. 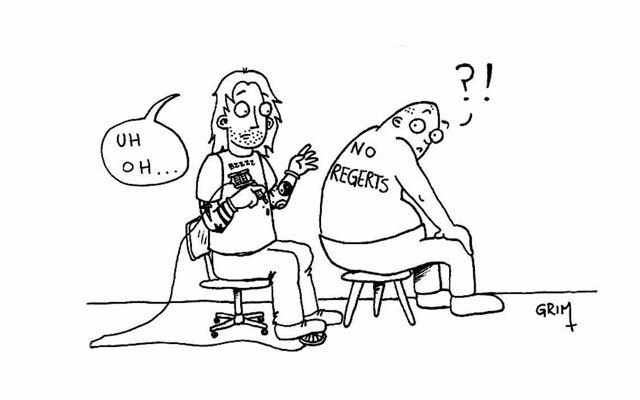 That is a regret. It is us letting our minds wish we had done something different, that would produce a different outcome. So what does a regret do to us? There are positives and negatives. Most of the time they are negatives because we forget that a regret can benefit us. What a regret does is allows our mind to beat ourselves up over something that has already happened. We set ourselves up for failure and wish on change that cannot occur. Regret can make us really sad and bum us out really easily. A lot of the time we catch ourselves picturing how better things would be if we had just done something instead of what we did. What is this doing for us? Nothing. It is not making us better, it is not bringing us into the past and letting us change anything at all. All that i does is harm our mental process. We let go control of the life we are living. 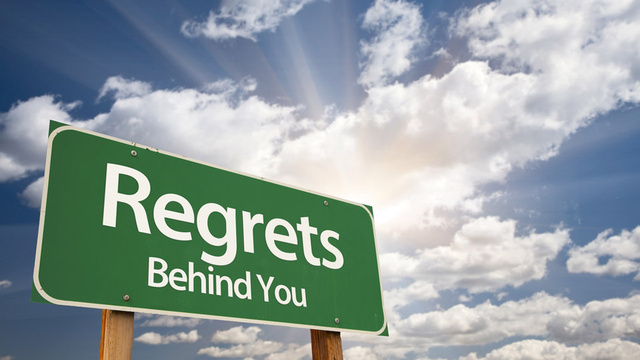 The benefit of a regret that we do not notice is it allows us to think in-depth of decisions we are able to make in the future. If you wish you had become an engineer, then hit the books and make it happen. If you wished you weren’t drinking and driving that got you the DUI make sure to not do it again. Everything that we have done we have learned from. Anything that we could have done we can do now. Just remember that. So last is understanding how to deal with regret and how to get it out of our lives. You need to learn how to be proactive and utilize what you have now. With regret we need to understand that anything that happened in the past, happened. We cannot change a single thing that happened, and will never be able to. We need to utilize what we can do now and change it for the future. Make decisions that will affect you tomorrow and benefit your future. There is nothing set in stone for what tomorrow holds even though we sometime think that way. We always have the opportunity to learn more, move wherever we want, love what we enjoy, and create our future. Yes it does take time, yes it will take work, but it is available. Understanding how to deal with regret is an essential characteristic in life. We run our own lives but so often forget we do. We think we are in a system where we do not have the availability to change things but we do. Go be who you want to be, and not let anyone or anything stop you. Make sure at all times you change what you want to change, and make your future happen for you. Now is the best time ever to get out there and make it happen. You got this.